Combine a soccer team with an iconic East Coast beer and we're sold. 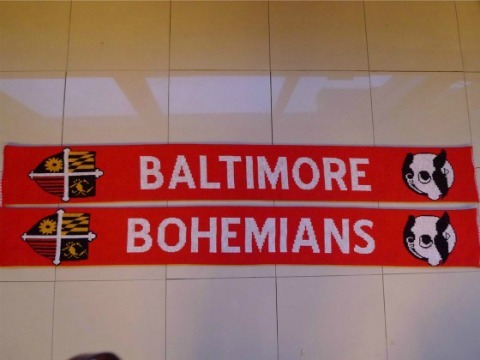 The Baltimore Bohemians will make their professional debut during the 2012 United Soccer League season. National Bohemian Beer began brewing in Baltimore back in 1885 and the one-eyed, mustachoed "Mr. Boh" has been a symbol for the beer since 1916. "Natty Boh" is considered the official beer of Baltimore since is being served at Memorial Stadium in the 1960s. Two weeks ago the club announced their partnership with Pabst Brewing Co. (which now owns the brand) to sponsor the team and just this week the club revealed their jerseys and scarves with Baltimore's beer featured prominently. National Bohemian even "sponsored" our 2011 Major League Soccer Super "Draft" with Mr. Boh as the host. If this isn't the perfect marriage of soccer and beer then we don't know what is. 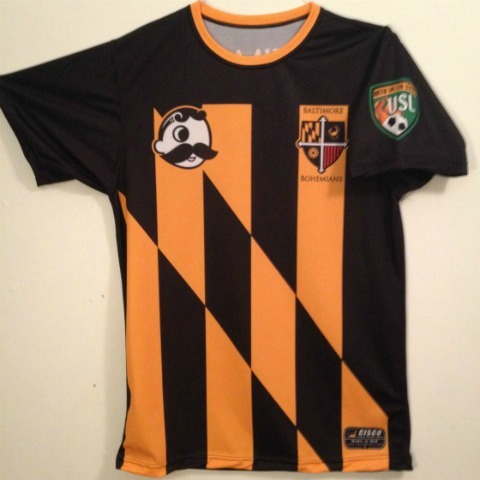 And don't worry... you'll be able to get a Natty Boh while watching a match this season as well. Plenty of FBM opportunities there. Be sure to follow the Bohs on Twitter, on Facebook, and the club’s official website. Spotted on "The Demin Kit".